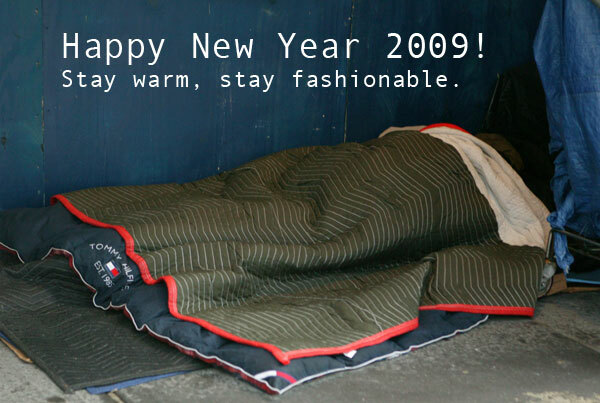 I am continuing this blog’s tradition of a New Year’s cards, even while thinking of closing down deadprogrammer.com. I might do it the Dr. Fun way – get it to 10 years and call it quits. This was a tough fricking year. I spent it on call for application breakdowns, learning system administration, stressing out of my mind, hitting hard deadlines, missing soft ones, gaining 15 pounds, etc, etc. I was stupid enough not to listen to my very smart friend and keeping my 401K in S&P 500 instead of in cash equivalent funds. I did have enough sense to sell it after Lehman Brothers shat the bed. This was my first year of being 99% free of Microsoft Windows. Indeed, once you go Mac you don’t go back. An interesting new web application that I worked on in my spare time should launch around February. I did waste a lot of my free time watching “my stories” (“The Wire”, “Mad Men”, “How It’s Made”, and other yuppie deligths), but I did not waste all of it. You’ll see. In any case, I wish you all a very happy, healthy and prosperous New Year!